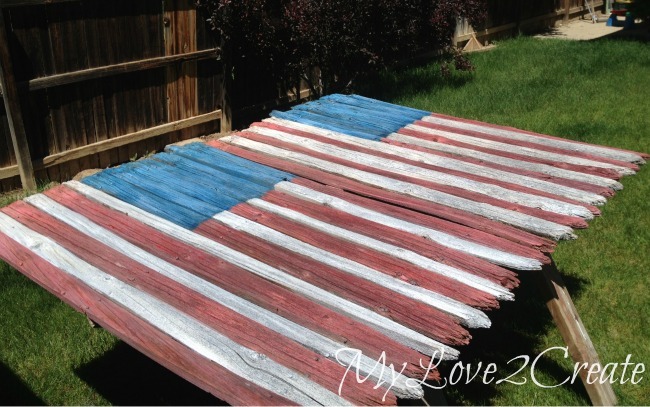 Some of you may remember my Scrap Wood American Flag, I made last year. Well I wanted to go a little bigger this time. And, I made two. Eeek! I was happy I could get all thirteen stripes and fifty stars. It all started with these fence sections, with super cool rounded wood pickets. 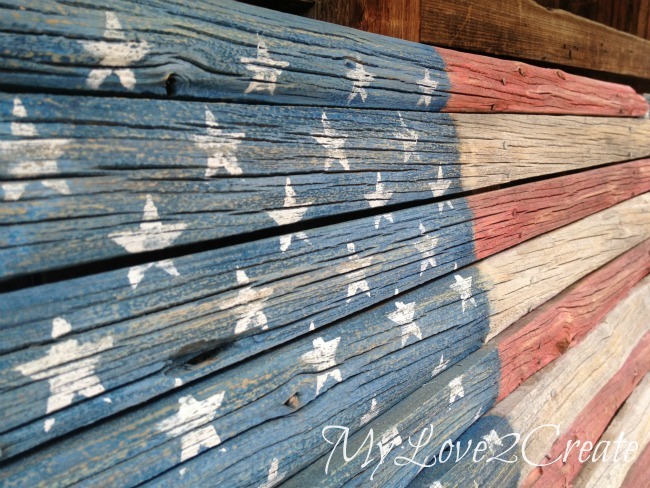 I actually used some of this wood on one of my Reclaimed Fence Wood Crates, and I used them Here too. My Father in Law gave them to me when they replaced their fence. I requested a few sections in tact, and now wish I had gotten more. 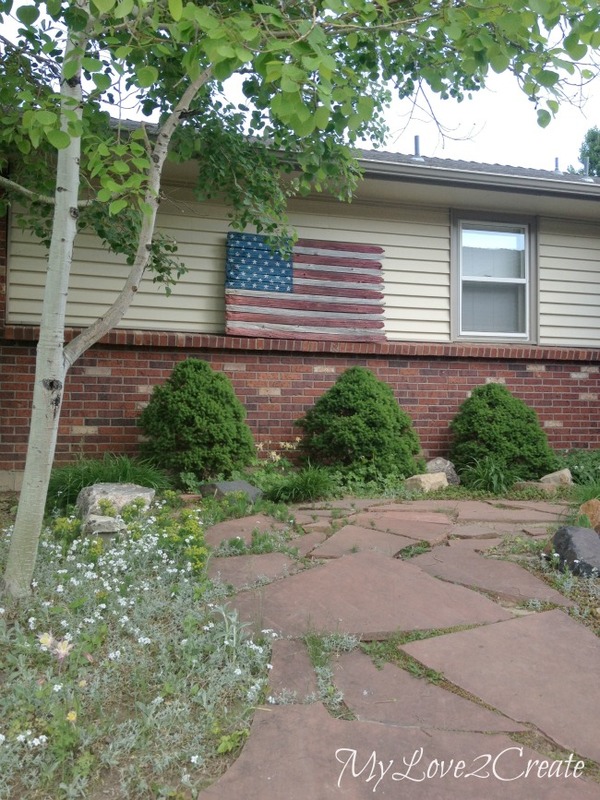 I wanted to make flags out of them because of the "tattered" looking edges, perfect for Old Glory. Over a year and a half later (story of my life) I am finally getting to them. I used my awesome Roybi Sawzall to cut them down to 13 pickets. And set to work. 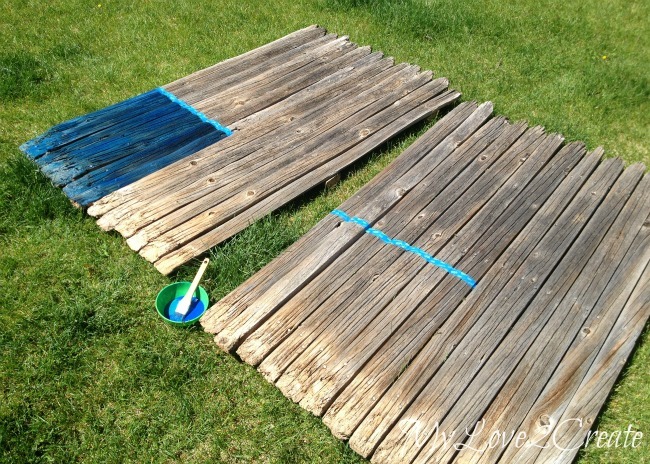 Taping off the blue section and using paint and lots of water to "white wash" the color on. It looks dark when you first apply, then dries lighter. I did the same watered down technique with the red and then started on the white. Opps, I dripped! No worries, I just wiped it off. 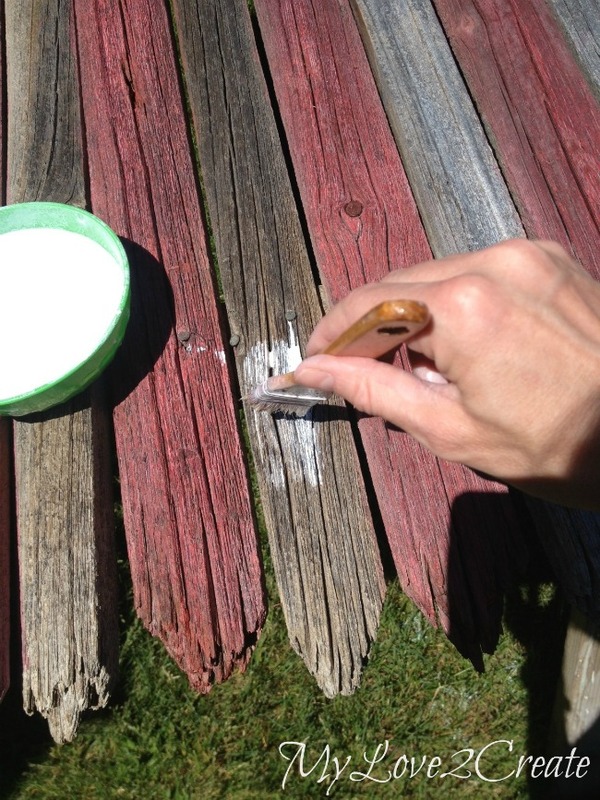 I did do a couple coats of white, it really soaked into the wood. We are ready for stars people! Notice how I got smart and put the flags up on my saw horses...well I wasn't smart enough to wear sunscreen...my neck still hurts. I hate it when I do that. I designed and cut some stars on my cricut onto contact paper. It didn't stick too well on the rustic wood, but good enough to make a stencil. I simply moved it down row by row to get the spacing right and all fifty stars painted. To keep them straight it helped to line up the stencil with the row of stars above. The wind kept picking up so I grabbed a hammer to weigh down my stencil. Please note, I did not water down the paint to stencil the stars. I loaded the brush, wiped most of the paint off and then stenciled the stars. Look how fun it is on my house! If I sell these I may have to make one for me, can't you just see one of these in a home over a fireplace mantle or a cabin? beautiful job Mindi! love your flags. 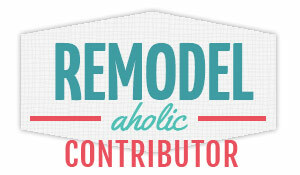 congrats on the feature over at remodelaholic! Love these flags! So awesome! LOVE this!! It even looks easy enough for me to make! 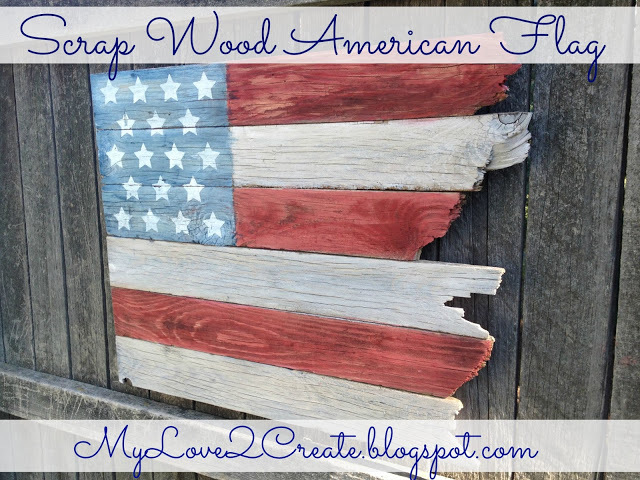 Thanks so much for linking up to Freedom Fridays - pinned and scheduled to share on Facebook! Perfection, Mindi! I love all of them…and now this one is HUGE! The bigger the better I say. 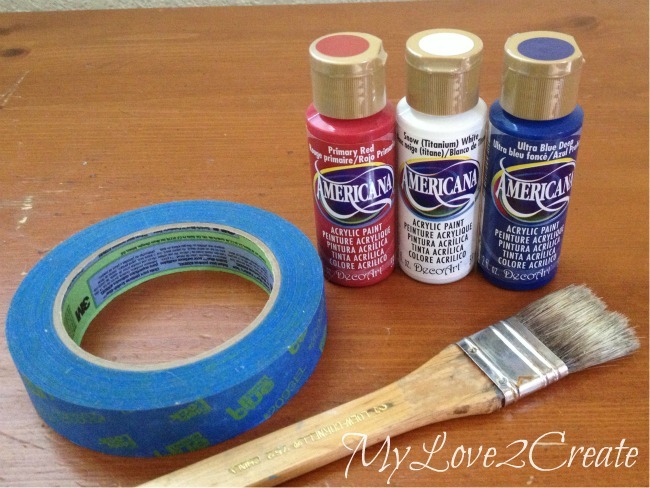 Thanks for linking up to Inspiration Monday Party! 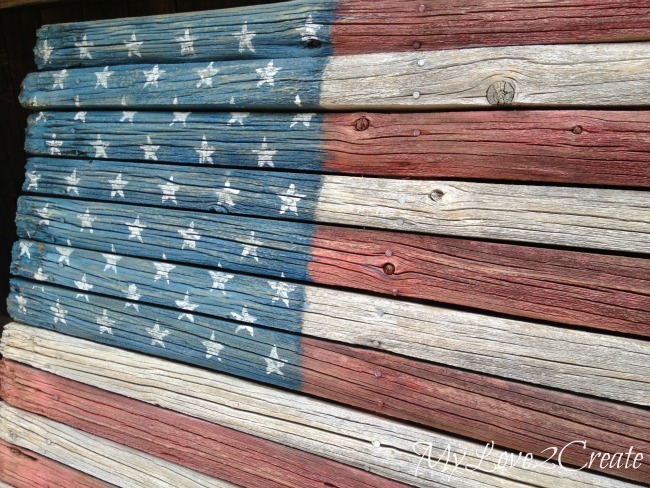 Hope to see you next Sunday…I am pinning your beautiful American flag now! This looks so good I can't wait to make one! I showed my husband and he thought it was pretty amazing to! Love it! Pinned it, thanks for sharing at Inspiration Monday! Mindi, these are awesome! If you do sell them, please let me know. 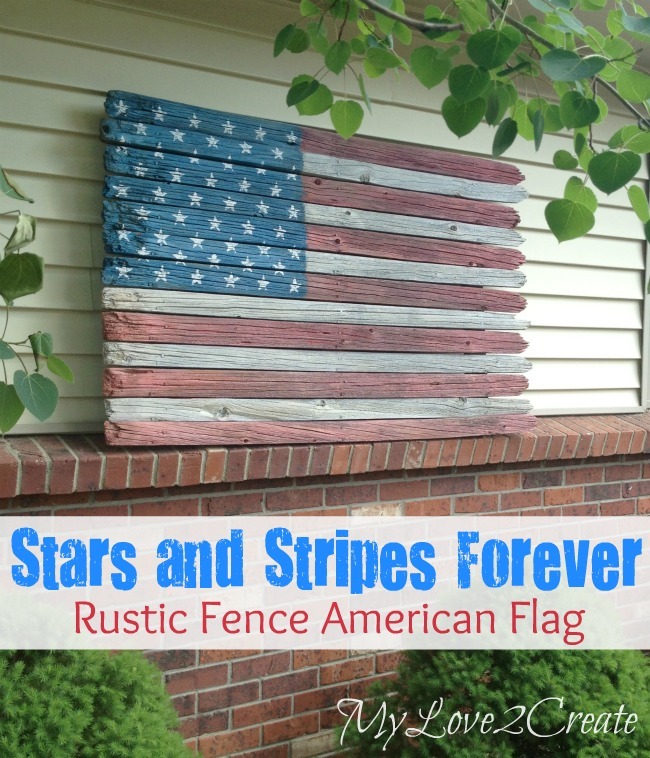 The look of the weathered fence is perfect. Great job! This is fantastic, LOVE how it turned out! Pinned :) Thanks so much for sharing at The Makers! Really love these and you're right, the ends of the wood is perfect! 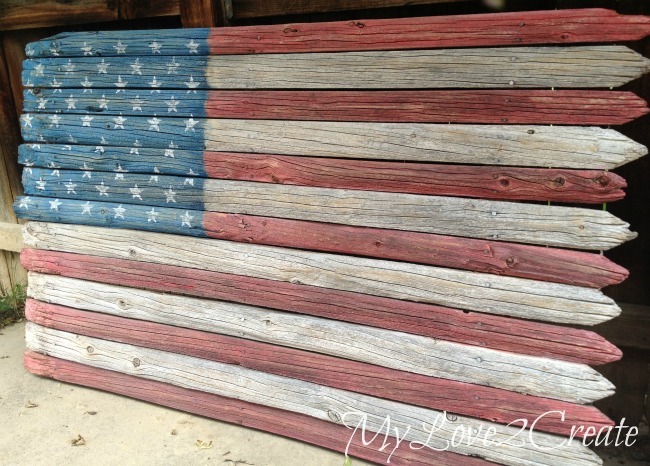 Love the rustic look of this Mindi! You can definitely see that on from the road! Thank you for sharing at What We Accomplished Wednesdays. Have a great weekend! 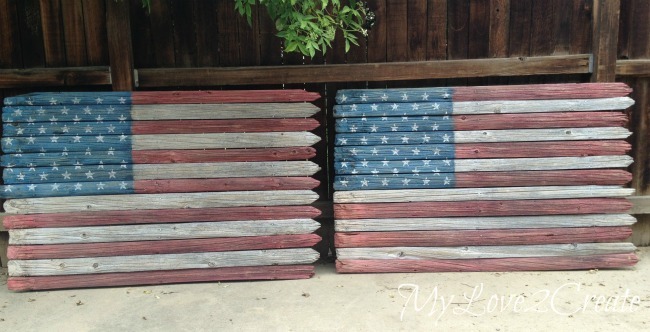 Geesh, now I want to make one! 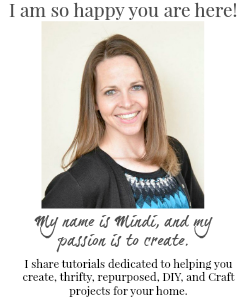 Mindi, this is fabulous! I love how creative you are and you could totally sell these. That is pretty darn creative! Thanks for sharing! Pinning it! Hi what a great project!! 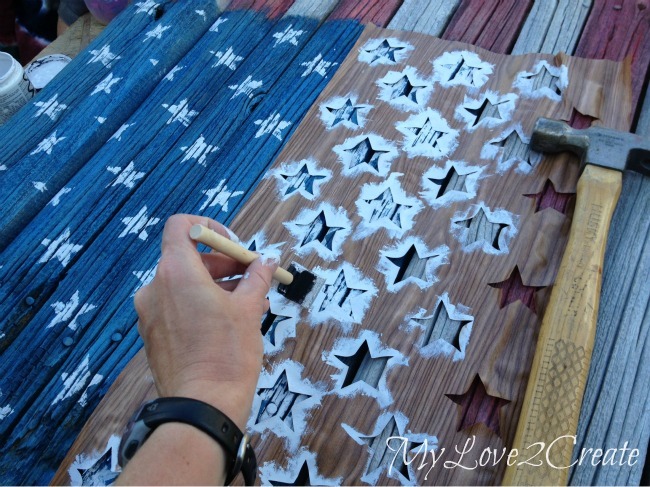 I was wondering at what size you cut your stencil and stars? 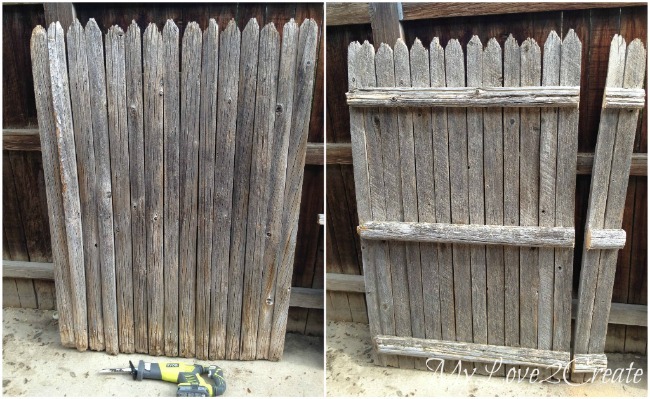 I have the cricut explore and would love to do this as I have several pieces of old fencing that I was gonna burn. Thanks so much for sharing and for the help.